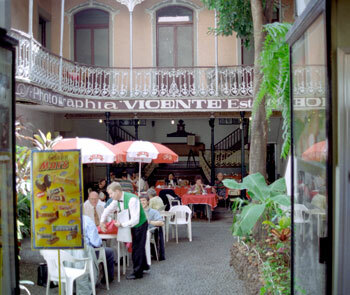 Funchal is the capital city of Madeira. 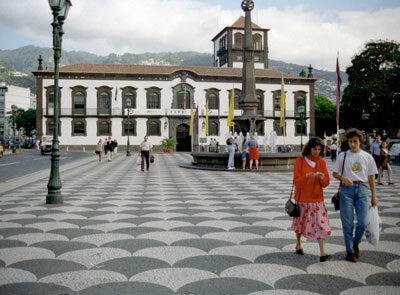 This is the Town Hall of Funchal. 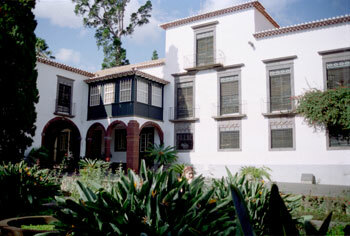 The buildings in Funchal are all painted white, the tiles along the windows are black and the roofs are red. To enhance the unity, the streets and squares are made of black and white stones, laid in geometrical patterns. a sweet Malmsey with coffee. A visit to one of the bodega's in Funchal is very interesting and also a lot of fun. We were on Madeira in November. 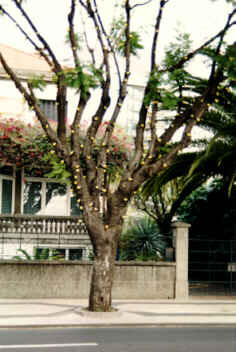 In this time of year, the trees are being decorated for Christmas. From December 8th the lights are on. The Quinta das Cruces (House with the crosses) is a beautiful house, made into a museum. 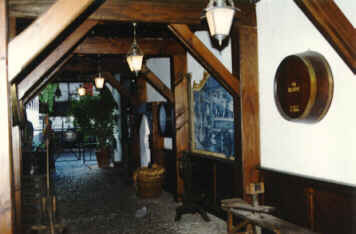 The interior gives an impression of the life of the settled people in the 17th-19th century. In the enormous garden are not only all kinds of flowers, but also decorated gravestones from the 15th and 16th centuries. In this patio at the museum of Photography you can have a cup of tea. When the museum is open, you can admire the old studio and about 380,000 photos of Madeira and portraits of royal visitors of the island.